Michigan Ross EMBA classes meet once per month on Fridays and Saturdays over the course of 21 months. The five-term program can be taken both in Ann Arbor and the school’s satellite campus in Los Angeles, with students on both campuses following the same schedule. Between on-campus residencies and the other in-person projects, students complete work through online courses, allowing for an easier work-school schedule balance. The school estimates that between 20-25 hours per week are dedicated to online work. The bulk of Ross EMBA student’s core courses are completed within the first two terms of the program, which starts in August. In the third term, students begin elective coursework, leading to the required ExecMAP (Multidisciplinary Action Projects) in the fourth term. Throughout the entire program, Ross EMBA students complete the leadership development experience, which helps carefully craft the student’s career goals and development. 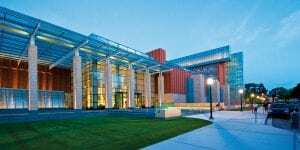 Combined, the Ann Arbor and Los Angeles Ross School of Business Executive MBA program features 124 students. They have about 15 years of work experience and are, on average, 38-years old. Women make up about 27 percent of the cohort, with international students comprising of about 20 percent. The average salary of the cohort is $191,396. About half of the students in the Ross EMBA program earn a promotion while earning their degree, while 90 percent of grads earn a salary increase within 18 months of earning the degree. The salary increase is around 26 percent. Tuition for Michigan residents during the entirety of the Michigan Ross Executive MBA program is $163,000. Out-of-state students pay a tuition rate of $168,000. A non-refundable $5,000 deposit is required to hold a spot in the program. Tuition covers the cost of books, on-campus meals, software, and other materials, but not travel costs. Applicants can help fund their education through federal and private loans, although the type of loan offered may vary by student. Interviews for select candidates are by invite-only.